By Filip Derma and Mateusz Mucha. How to calculate the annual income? 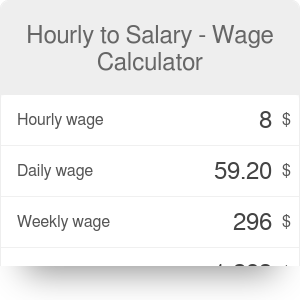 Hourly to salary wage calculator is a tool that helps you determine your wages and salaries depending on the period you take into account. You know your hourly wage and wonder what is the annual income? Or maybe you want to compare a couple of job offers where the amount of money employers offer is expressed per various periods? Check this flexible annual salary calculator to recalculate all your payments. In the article below, you can find information about salary ranges, comparison salary vs. hourly employment and a brief history of wages and salaries. As an addition, we will tell you how to convert the hourly rate to salary and guide you through the proper usage of this wage calculator. There is no rule when it might happen, but at some time you may meet that uncertain moment in your career. We're talking about the time for a job change. The reasons which lead to that decision might be various (like problems in your current work, willingness to try something new, or facing a huge investment that requires you to have a higher income). Usually, it's not an easy task at all - it can cost you lots of time and effort spent on browsing through job offers. You'll need to change your coworkers, working place, community - all the things that you already know well. These circumstances might be demotivating or frustrating (hopefully not both at once). However, it is not a reason to give up your decision about a job change. You need to face your fears and overcome these difficulties! Nowadays, worldwide access to the Internet gives you the possibility to look for job offers in your city, but also in your state, country, and even abroad. We can say most certainly that a vast amount of job offers are available online. There is no need to leave home when looking for the best offers. But there is another side of the coin - so many potential possibilities might overwhelm you. The choice of the best job proposal is getting tougher and tougher. Fortunately, there are a few factors that can help you make the final decision. All of these sum up to the same value, but you need to consider them in the exact same period. Without recalculating payments into the same base unit, you won't be able to compare the offers. For example, you have three different proposals expressed as a monthly income, an annual salary, and a weekly wage. First, decide to which wage you will recalculate (e.g., the annual income). Doing the maths might be a bit tricky, but once it's over, you'll have a clear comparison between the three offers. If you have many offers to recalculate, though, it's bound to take a long time, and you have a considerable chance of making a mistake. A much more convenient way is to use this wage calculator and have all the results immediately. This hourly to salary calculator has some cool features, let's take a closer look at them. It can save lots of your time and effort because you don't need to do all these tedious math calculations to standardize the salary offers. We have created for you an easy and user-friendly wage calculator that recalculates all types of income (listed in the previous chapter). The only action we ask you to do is to enter two initial values necessary for computations: the amount of money for one chosen wage type and the number of hours you work per week. After that, you will see five different wages results of the same salary, ready to compare with other offers. Sounds great to us! We know that this salary converter is used by people from the USA, Canada, Europe, Asia, and other continents, so the appropriate currency for your country is already set by default. You can see it after the numbers (e.g., $, €, £, ¥, etc.). Good to have it, isn't it? For the sake of simplicity and clarity, we made some assumptions when creating this paycheck calculator. We assumed that the work-week has 40 hours (but you can easily configure it according to your preferences); a year has 52 weeks, and one month is 1/12 of a year. The term salary range is one of the most significant factors when considering a particular job position. Maybe you don't know what it is about, if so - focus on this paragraph. Wage range describes the limits of earnings planned for the job position. Most companies usually don't make exceptions from the salary ranges. The money they can spend to hire a particular specialist are strictly defined in its budget (that's the main reason why they don't offer increased payments). Notice that salary means something different for you as the individual and for company's financiers. From an employee's viewpoint, salary range includes compensation parameters they want to earn. For the company, it will be an amount that it is able to pay a new employee in a particular position and how much current employees can expect to earn in a specific position. In reality, an employer has to pay much more for you than your salary is. You "cost" them more, because of mandatory taxes that they are obliged to pay for each employee. What might be not so obvious, from the business point of view, each staff member is an expense for the company. It's the effects of their work that bring real income. In this example, the monthly salary range is $2,500 - $3,500. The wage ranges give flexibility for both sides - the employee and the employer. It offers you (the individual) the possibility to choose the most satisfying job (moneywise), and the arguments to negotiate the salary level. On the other hand, the company's representatives know well if their offer is competitive in the labor market and whether they can afford to hire that specific type of specialist. The level of a salary your future employer will offer you depends on a few aspects. In general, the expected payment should be around maximum for someone who is highly qualified and experienced. Somebody just after an internship or starting in a particular field must count on accordingly lower wages (usually equal to minimum salary). This is normal, and you should be patient while climbing up your career ladder. Factors like commitment, review scores, and individual achievements may highly influence your value as a worker and help you earn more money (if the scores are positive, of course). What suits you better - become a salary worker or work for hourly payments? There are differences between them, and it is good to know them well. Hourly workers get the remuneration for each hour they work, and that includes overtime (if they have done more than 40 hours per week or other contracted number). If you work as a salaried employee, getting overtime payments is not a rule. It depends on the local country (or state) work-law regulations. Keep in mind to check whether your company compensates for the overtime before signing a contract. How to calculate the payment while being on hourly contract? To do this, you should multiply your hourly rate by the total number of worked hours in a considered period (e.g., week, month, etc.). Assume that the hourly rate is $18 (as mentioned in the previous example). The worker did 100 hours in a month (with no overtime). In this case, their monthly payment will be: $18/hour * 100 hours = $1800. According to the Fair Labor Standards, all hourly workers are non-exempt (term clarification below) and have to be paid for overtime hours. The rate for extra hours is different than standard and equals 1.5 basic hourly rates. In the case of our example, the overtime rate is equal: $18/hour * 1.5 = $27/hour. So, to have clarity, let's calculate the monthly payment including overtime hours. Let's say our employee worked for basic 100 hours and extra 8 of overtime in a month. Their salary in that case would be calculated respectively: $18/hour * 100 hours + $27/hour * 8 hours = $1800 + $216 = $2016. The earnings of hourly workers may vary widely. The reason is, they usually don't have a guaranteed number of working hours per week (or another contracted timespan). Its amount is determined by a monthly/weekly schedule, and shifts calendar in some companies may vary a lot each time-span. This type of employees must be paid at least the minimum wage (the amount varies across the U.S. states). All the other regulations must be clearly covered in a personal contract. Let's focus on salary employees now. The main difference in comparison to hourly staff is they have a guaranteed minimum annual level of compensation. The yearly wage is divided by a number of pay periods (mostly 12 months) to find the period salary. Sometimes, in the U.S. you can come across the enigmatic term called exempt employee. According to the Fair Labor Standards (regulation of payment rules), the term exempt is related to salary workers, and their exclusion from paid overtime (mostly they are excluded, but it's not a rule). However, in many countries (even in the USA) companies offer various ways of compensation for overtime. For example, additional money (calculated according to the number of extra hours), days off (related to the amount of overtime), free tickets to cultural institutions, or other benefits are popular options. Salary worker can also be classified as non-exempt under Fair Labor Standards. Thus the company has to pay respectively 1.5 wages for each overtime hour over standard 40 per week. We suggest checking in your country's Labor law or state's Department of Labor whether your job is not the exception from that rule (it may differ between locations) and you might be unpleasantly surprised. Enter the hourly rate in the "Hourly wage" box. Enter the number of hours you're going to work in a week (it defaults to 40). See how much are you going to earn weekly, monthly or annually. It works in all directions - you can provide your hourly, daily, weekly monthly or annual salary and get all the other values. You already know that "wage" is a compensation for a standard unit of working time. The earliest used unit, which still is quite popular, was a day of work. However, the invention of clocks enabled the division of a day of work into smaller units. Ever since the "hourly wage" has become the predominant unit of employee remuneration. We don't know when the first salary has been paid but some estimate it could have been between 10,000 and 6,000 BC. Some connect the word "salary" with the Roman Empire and salt - Roman soldiers were presumed to have been paid in salt - a compensation called "salarium". Regardless of the exact story, Roman Empire established a form of work-for-hire, which also existed in medieval Europe, although it was rather rare. Salaried work became more widespread during the Second Industrial Revolution (1870-1930). Its expansion is connected with the rise of modern business corporations and difficulties in measuring office work output in terms of hours or pieces. The 20th century saw another rise in salaried employment due to the development of the service economy where the share of industrial jobs declined. Filip Derma and Mateusz Mucha. Hourly to Salary - Wage Calculator can be embedded on your website to enrich the content you wrote and make it easier for your visitors to understand your message.